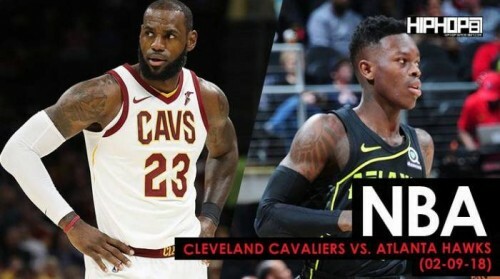 The energy in Philips Arena on for this Friday night matchup between the Cleveland Cavaliers and Atlanta Hawks was one for the ages. Tonight in Atlanta, the Cleveland Cavaliers picked up a (123-107) victory against the Atlanta Hawks. LeBron James and the new look Cleveland Cavaliers poured into Philips Arena on Friday night to a packed house where many fans were cheering for the road team. After the Cavs shook up their roster on Thursday night right before the NBA trade deadline, the short handed Cavs came out on fire and handled business here in Atlanta. The night was highlighted by the play of two players, LeBron James and Kyle Korver. LeBron James picked up where he left off in Wednesday nights matchup vs. the Timberwolves. LeBron picked up a triple-double on the night finishing the game with 20 points, 10 rebounds and 17 assist. LeBron’s court vision was on point tonight as he set up players are over the court. It was a primetime performance for the man in the red “Primetime” Nike Lebron 15’s. Former Atlanta Hawks sharpshooter Kyle Korver also had a huge game for the Cavs. Korver was splashing three point shots all night long and his performance in the third quarter was a blast from the past. Korver had a 15 point third quarter where it appeared he couldn’t miss a basket. Korver finished the night with 30 points for the Cavs. Jeff Green added 24 points off the bench for Cleveland. It was a tough night shooting for the Atlanta Hawks. Dennis Schroder has a big first quarter for the Hawks finishing with 12 points in the opening quarter. Schroder finished with 25 points on (10-18) shooting on the night. Taurean Prince was (0-9) from three point land finishing with 15 points. Off the bench it was a big night for point guards Tyler Dorsey and Isaiah Taylor who both finished the night with 11 points. Dorsey’s play off the bench has been great as off lately. The Hawks are off on Saturday but they are right back in action on Sunday as Blake Griffin and the Detroit Pistons come to town at 3:30pm. The Cavs have a big matchup on Sunday as well as the will face the Boston Celtics.